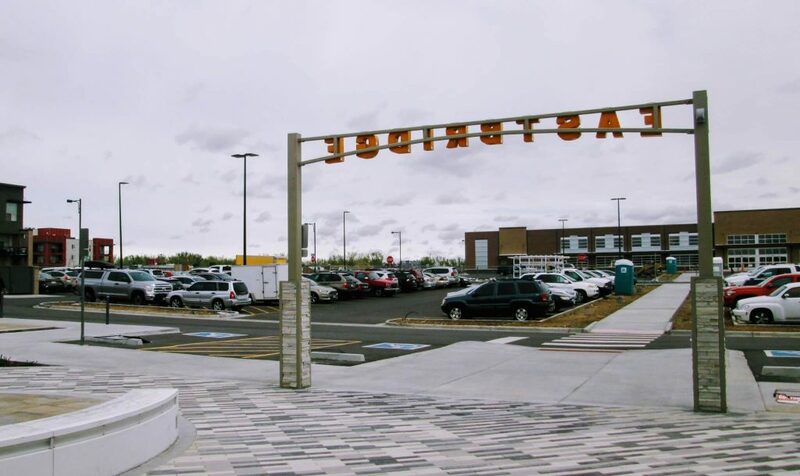 Next Door Stapleton Restaurant Food Review - Come adventure with me. What has to be the best vegetarian burger I’ve ever eaten, Next Door offers up a dreamy concoction of beets and flavor sided with an arugula salad that even meat lovers will stand in line for. When ordering, be sure to get the Smashers to go with them. You’ll leave the happiest vegetarian you’ve ever been. But since this visit was to try out a some of the additions to the new menu at the new location, I decided to try something new. With husband in tow, I ordered the salmon bowl, and he ordered the meatball bowl. 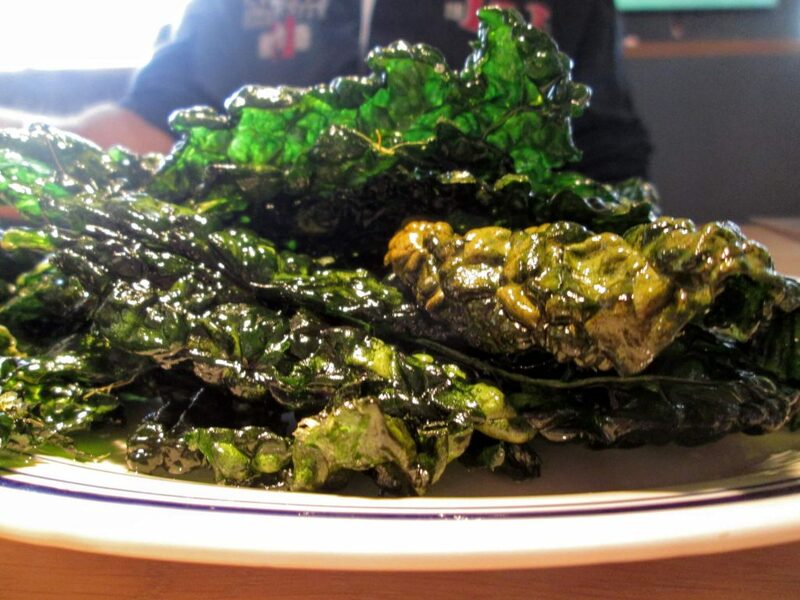 We started with the always delicious kale chips and the new grilled broccolini. With the great service we always expect from Next Door, our appetizers came out quickly. As usual, the kale chips rocked. 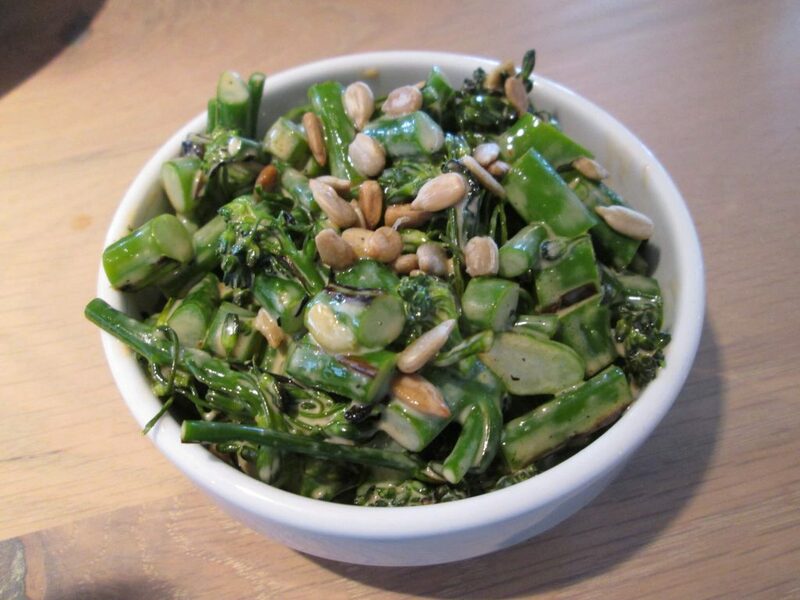 The broccolini, a bit on the spicy side which we loved, fired up the palette. It’s the perfect size to share a couple of bites. Soon, our bowls arrived. 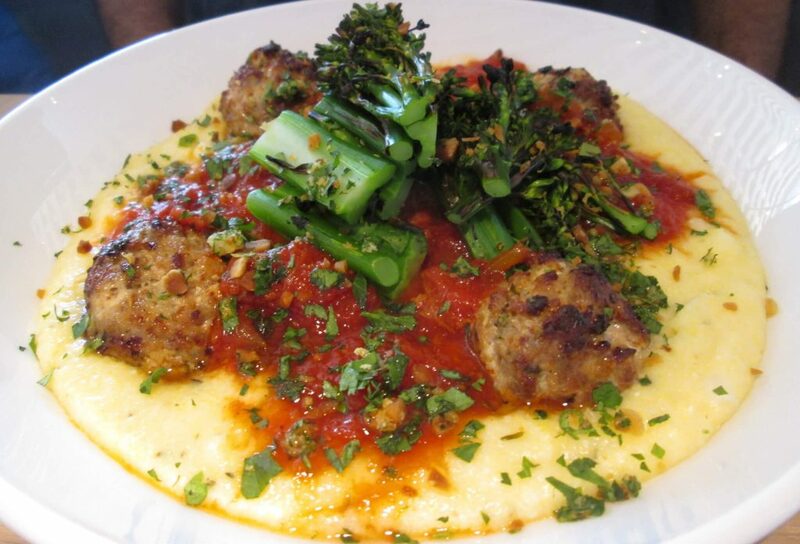 Being a vegetarian who sometimes eats some fish, I passed on trying the meatballs, but the polenta underneath melted in my mouth. No graininess here, I could imagine ordering just the polenta alone. The hubs loved the meatballs, which had a nice speckling of roasted veggies intermingled, and he said he’d order again. 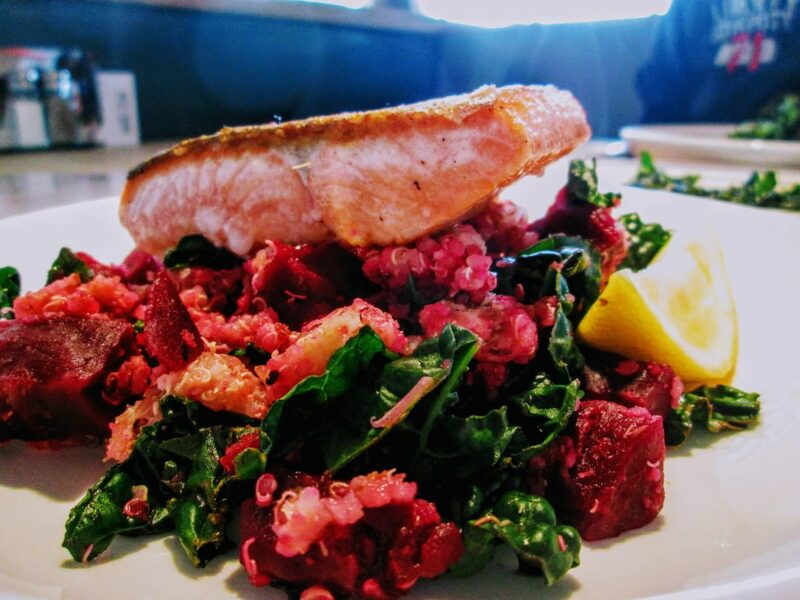 Beautifully presented, my salmon bowl piled a kale, beet, and quinoa mixture and topped it with the wild Alaskan salmon. I could taste the quality immediately, and the fuchsia, salmon and dark green colors screamed out of the bowl in gorgeous temptation. Each bite held the exact right mixture of ingredients, giving balance to my taste buds. I loved the bowl, but I did find it was a tad dry (which I’m going to chalk up to first day jitters in the kitchen) and perhaps a dollar or two too expensive. While enjoying our lunch, we saw a waiter serve ice cream sandwiches to the accompanying table, and we couldn’t resist ourselves. 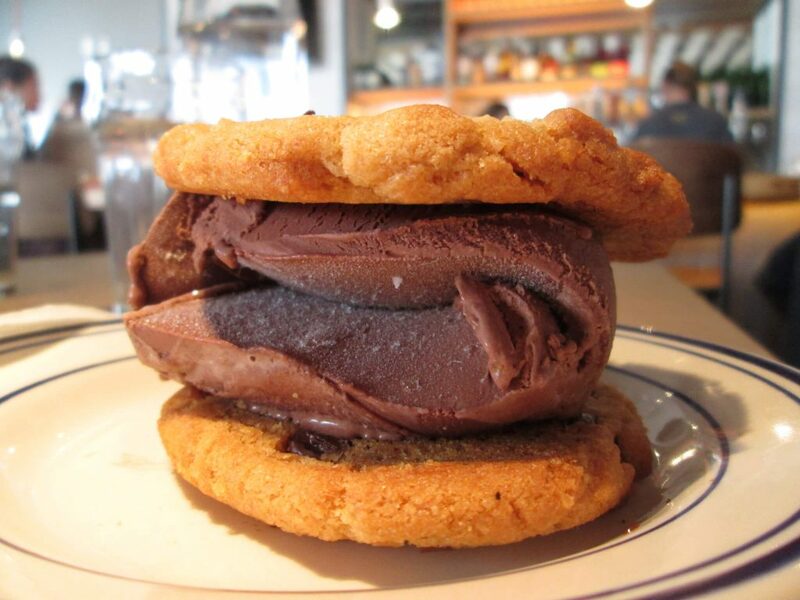 Sandwiched between two warm, gooey, chocolate chip cookies, we had the choice of vanilla, chocolate or cupcake ice cream. Ignoring the vanilla, we dug into our two choices. I couldn’t get over how the ice cream was cold but the cookies were warm. Nice job, chef. If you like the industrial look, or you’re looking for a good cozy spot to do a photo shoot with your honey (try Eliza! ), both Next Door and the surroundings at Eastbridge will welcome you. There’s even a fireplace in the center of the public area just awaiting a good chilly day for neighbors to gather around. Inside Next Door, they’ve stocked the shelves with plenty of games to entertain. It reminds me a bit of Four Friends Kitchen.